Where it is impossible to separate workers from noisy equipment, but their hearing needs to be protected, an alternative approach is to use noise refuges. For example, a firm that manufactured cardboard containers installed a noise refuge to provide an effective working area close to the main production lines where A-weighted noise levels approaching 97 dB had been measured. The firm had a fully air-conditioned enclosure installed, consisting of double-skin acoustic panels that incorporated acoustic glazing to give good all round visibility into the production areas. Internally, the refuge was finished to office standards - tiled floors and acoustically absorbent ceiling and walls. The example shown produced a difference between outside and inside noise levels of some 30 dB. 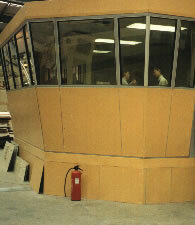 Refuge manufactured and supplied by Noise Reduction Limited.